Paul, A., Bal, T., Dubey, R., Ghosh, M. (2013). A Statistical Approach Towards Development and Optimization of Conventional Immediate Release Tablet of Nimorazole by Wet Granulation Technique. Iranian Journal of Pharmaceutical Sciences, 9(4), 23-38. Aditi Paul; Trishna Bal; Ram Dubey; Manik Ghosh. "A Statistical Approach Towards Development and Optimization of Conventional Immediate Release Tablet of Nimorazole by Wet Granulation Technique". 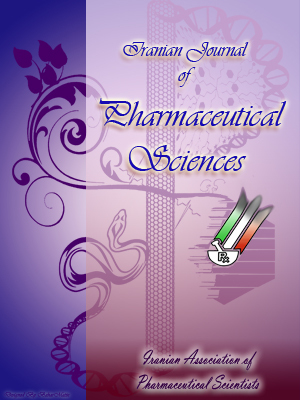 Iranian Journal of Pharmaceutical Sciences, 9, 4, 2013, 23-38. Paul, A., Bal, T., Dubey, R., Ghosh, M. (2013). 'A Statistical Approach Towards Development and Optimization of Conventional Immediate Release Tablet of Nimorazole by Wet Granulation Technique', Iranian Journal of Pharmaceutical Sciences, 9(4), pp. 23-38. Paul, A., Bal, T., Dubey, R., Ghosh, M. A Statistical Approach Towards Development and Optimization of Conventional Immediate Release Tablet of Nimorazole by Wet Granulation Technique. Iranian Journal of Pharmaceutical Sciences, 2013; 9(4): 23-38. Till date, most of the drugs have been given in conventional immediate release dosage form. Nimorazole is an anticancer drug, used as a hypoxic radiosensitizer in patients undergoing radiotherapy and no formulation has been available in the market till now. Hence, for the purpose to develop an immediate release dosage form, a statistical optimization process has been employed to quantify the effect of two primary excipient MCC and maize starch on its immediate release characteristics. A series of combinations by varying the composition of the two excipients were prepared and their effect on tablet property such as disintegration time, hardness and friability were analyzed using statistical design software. An optimized formulation generated by the software, was evaluated for tablet properties and drug-excipient compatibility study was carried out by FT-IR analysis and DSC thermogram analysis. A SEM image of the granules was recorded to study surface morphology. A 70:50 combination of MCC and starch was found to be the best optimized formulation for an immediate release tablet without affecting its hardness and stability. Disintegration time increased with increasing amount of starch, but decreased with increasing amount of MCC. The low prediction error observed during evaluation of the final formulation indicated the high prognostic capability of the RSM methodology. FT-IR and DSC study confirmed the compatibility of the drug with excipients.